Institute of Laser & Aesthetic Medicine (ILAMED), which is an Unit of Global Mediversity Private Limited, is quickly becoming famous in the World for its excellence in teaching with a wide range of courses. The courses here are designed as the perfect amalgamation of clinical practice and exploration of aesthetic medical facets. This enhances your practice regardless of medical specialty. ILAMED embodies the vision of its founder, Dr. Rana, which is providing world class teaching to professionals and bridging the knowledge and research gap between East and West in this challenging field of Aesthetic Medicine. The Institute is quickly becoming famous in the World for its excellence in teaching with a wide range of courses. Our faculty comprises of renowned national & international dermatologists and plastic surgeons from India, Germany, France, Turkey, Italy, UAE, South Korea & USA. 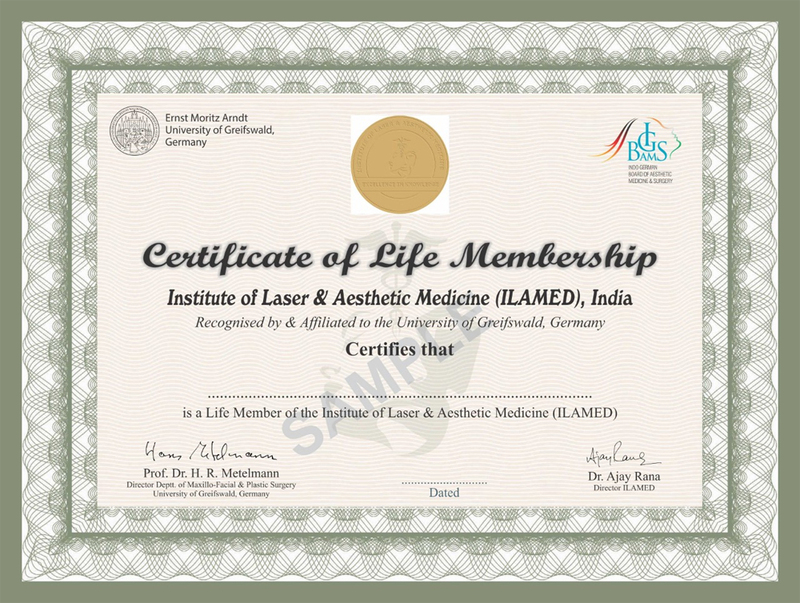 ILAMED’s motto is Excellence in Knowledge, which stems from the vision of its founders Dr. Rana, who laid down the foundations for a word-class Institute that can leave an enduring legacy to the country; and defend and promote Laser & Aesthetic Medicine. Excellence is distilled at all the operational levels of the Institute: be it in the choice of Faculty, the approach towards various curriculae, or the selection of students and partners. It is only through this vision of excellence that the best can be achieved, that the best can be offered to the doctors and professionals coming for training at ILAMED, who will then bestow the knowledge they’ve acquired at ILAMED upon the society. Act as the knowledge platform of reference in Laser & Aesthetic Medicine in India for professionals interested in Laser & Aesthetic Medicine in the country and abroad. Provide a forum for academic and professional exchange for physicians from over the world who practice and research in Laser & Aesthetic Medicine. Promote the safe use of Lasers and an ethical approach to Aesthetic Medicine at large. Promote the advancement of knowledge in Laser & Aesthetic Medicine through the grants of research fellowships and the organisation of world-level seminars and conferences in the country. Avail information and raise awareness on good practice and advantages of Laser & Aesthetic Medicine to the public.